Castleford Tigers Supporters Club's evening with Andy Lynch. 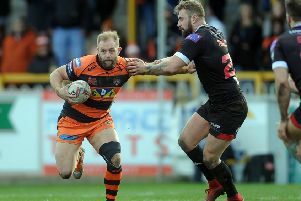 Castleford fans can join in a celebration of one of the club’s great recent players as an evening with Andy Lynch takes place at the Tigers ground tomorrow night. Castleford Tigers Supporters Club’s latest monthly event, sponsored by BPS Print & Design, is a celebration of a Rugby League hero still going strong in Super League. As Andy’s testimonial comes to an end, the evening will offer a chance to discuss his career past and present, his life and what the future holds. The event takes place at the WSTS Suite, at the Mend-A-Hose Jungle on Tuesday night (7.45pm). Admission is £1 members, £3 non members. A raffle and auction will be held on the night and all money raised from the event will be donated to Andy’s testimonial.